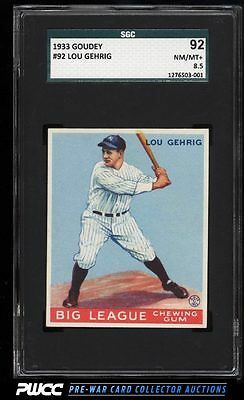 Hands down the single finest 1933 Goudey Gehrig we have seen in person. We've seen 9s and other 8.5s but this one takes the cake! A staggering example which seems to have fallen directly from a gum wrapper just yesterday. Undeniably pack fresh throughout with four fresh corners, flawless edges, and the brightest borders we have seen on this issue. Everything is where it should be in upholding the immense expectations set forth by the lofty SGC grade. This comes with our highest recommendation. One of nearly 20,000 cards, lots, and sets up for bid in our 7th Auction of 2016. Click on the link above to view the other PWCC auction lots.